Arsenal took on Hull City in crucial home game at the Emirates on Saturday and it was last of four game ban imposed on Wenger who watched from the stands. Hull City stuck to their guns in opening half hour and frustrated Arsenal but were harshly undone when Alexis Sanchez scored the opening goal. However in the build up he looked to have handball but referee failed to spot. Arsenal fans were clearly not happy with the recent run of results and they moaned throughout first half. 34′ 1 – 0 Alexis Sanchez scored in 35th minute of the game to finally break Hull City’s resistance and put Arsenal in lead. Arsenal fans were moaning throughout the opening half and signs do not look good for Arsene Wenger’s stay at the club. 90′ 2 – 0 (Penlaty) Alexis Sanchez his 17th goal in premier league this season with a late penalty. Since Marco Silva has taken charge of Hull City they have been absolute superb in their performances. They United to a 0-0 draw at Old Trafford and followed that up with a stunning 2-0 win against Liverpool which set them up nicely as they go into the important 2 months of the season. They will fancy their chances against struggling and severely under pressure Arsenal side where any positive result will cap off a superb couple of weeks. Arsenal on the other hand might end up out of the top 4 if they drop points combine with Liverpool and United winning their respective games. However last time these two meet was back in September when a crucial 3-1 win for Arsenal put them on a winning streak and Wenger will be hoping a similar result this weekend. 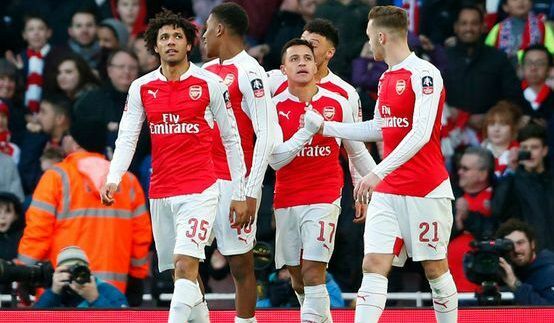 17′ 0 – 1 Alexis Sanchez scores in just 17th minute to put Arsenal on their way to comfortable win against Hull City. 55′ 0 – 2 Theo Walcott scored his 100th goal just after the break to give Arsenal a comfortable edge. 79′ 1 – 2 Robert Snodgrass continue superb run of goal scoring form as he brought Hull back into the game albeit momentarily. 83′ 1 – 3 Alexis Sanchez wrapped up the three points with a late goal. Team News & Lineups: Arsenal’s 1-1 result against Paris Saint Germain in the midweek was kind of lucky as they struggled for most part in that game but it was expected as Arsene Wenger made several changes in the starting lineup. Against Hull City we can expect a full strength side with Giroud likely to start upfront while Alexis Sanches, Ozil and Ox-Chamberlain to start in attacking roles alognside Xhaka and Cazorla starting in the midfield. Hull City will lienup with Abel Hernandez playing upfront while Diomande and Snodgrass playing in supporting roles. Mayler, Huddlestone and Clucas to play in central midfield roles. This is how I expect both teams to lineup. Match predictions: Arsenal look shaky at the back and there is always a mistake in their defence but going forward they are starting to get their act together. Olivier Giroud will be key in this kind of game and I expect him to hit the target in what could be a narrow win for Arsenal.